With a sweet and spicy heart (from hyancinth, cassis and sandalwood) and a hint of powerderiness, Chamade is not for the faint of heart. I imagine a woman with a little too much makeup on, a '60s woman who has a spiritualist and makes her own Kombucha tea. 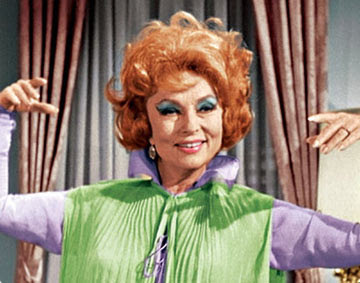 I picture Endora, Samantha's mother from the show Bewitched. It's a fragrance from another time, as wild and loud as a Pucci print. Hooray! Chamade! One of my favourites. And I was laughing out loud reading this. Have you been spying on me? Sadly I was born a little too late, but I always loved Endora's style! The thing I've picked up from Chamade, is eventually it smells like Samsara. Maybe not the new synthetic-sandalwood-Samsara, but the original. And JP Guerlain composed both for one of his lovers. I would like to think it's the same woman, who reportedly loves jasmine and sandalwood, and that the difference in the two fragrances illustrates the shift in styles and mores in the intervening years. Chamade is a hint of collarbone and Samsara is a surgically enhanced chest. Thanks for your answer on Samsara. I discovered today your review on Chamade, which is one of my favourite. It's funny you depict it as a devilish step-mother scent :D, when I see it as a very romantic and self-assured young woman. 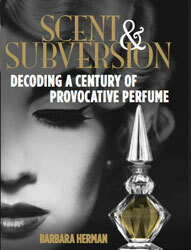 You don't tell how the perfume evolves, and I fear you may have missed this part. Because, personally, I don't like the opening of it, due to a green-milky quirky dissonance, but I do love the drydown. There is a lot of benzoin in the drydown, it's a kind of incense (tree tear) that reminds vanilla and caramel, plus the uplifting quality of an incense. And it's wonderful in the final accord of Chamade, and last many hours. So Chamade is really worth to be smelled once in extrait form, to more fully catch the drydown, get more true jasmine, and avoid the overdose of vanilla that spoiled the actual formulation of EDT and EDP. On fabric or on skin, I don't know, but it is a very cuddling fragrance when it reaches its drydown (the opening is still a bit harsh during one hour). I'd have to try it again, David, but that sounds wonderful! Does anyone remember the radio commercial for Chamade perfume? I used to hear it as a teen-ager, I still remember it. I have never seen or smelled the perfume itself - but I was thinking of old jingles from my childhood, and tried to find this one on the web. Found your site instead! I'm still curious about that commercial. Hi joy. Perfume radio commercials? Oh, man. Now something else to be obsessed by! I am on the trail. I'll let you know if I find out anything!